Albany’s Bowman Park on the Willamette River on Friday afternoon. 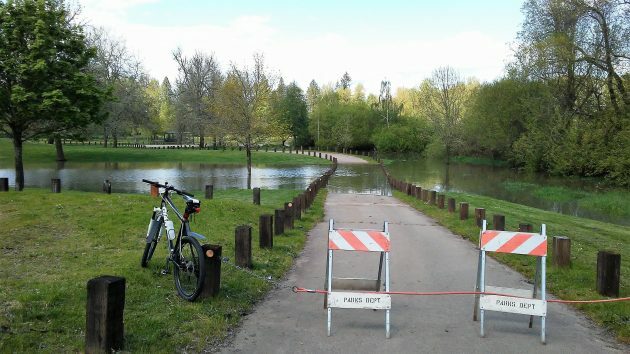 Patrolling my riverfront beat on Friday afternoon on the bike, I could not help but notice that the Willamette had risen rather sharply over the last few days. Looks like the Corps upped its releases from the upstream dams. The river rose 6 feet, from 8 to 14 feet on the Albany gauge, from Sunday through Friday afternoon. The crest was 14.3 feet, and the forecast is for the water level to go down over the next few days. 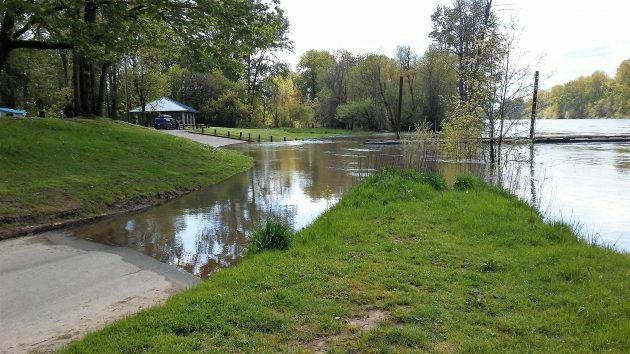 At Bryant Park, the Calapooia River backed up into the park near its confluence with the Willamette, as it usually does in winter and spring. The Calapooia has no dams to regulate its flow (the Holley and Cascadia projects having been scratched decades ago), but this stream, too, was running higher than it had been for a while. As usual this time of year, this segment of the Bryant Park loop road is closed . 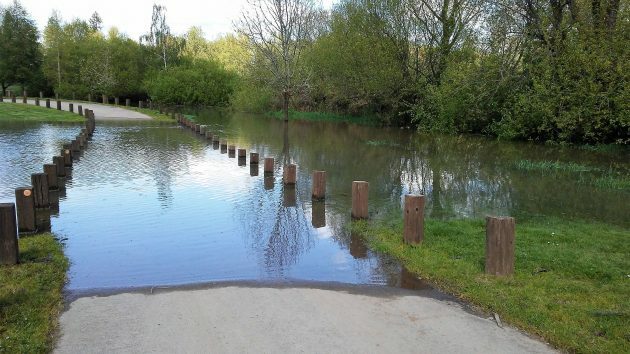 One could ride through this, but why get your socks wet and mud on the chain? On Saturday, my daughter and I took a kayak trip from Bowman Park to Buena Vista. The water was fast and​ high, but smooth and beautiful. The 12 mile trip took only 2.5 hours. License, life vests, and whistles along with water and snacks made for a sweet, scenic excursion!